This is a simple question to answer because the average home is already filled with products enhanced or reliant upon nanotechnology. In fact, there are several online repositories listing the more than 2,000 commercially available products that incorporate nanotechnology. The application of nanotechnology in some areas, such as batteries, microelectronics and sunscreens is relatively well known. Let’s take a virtual tour through a home to see what else we can find. But first, what does nanotechnology mean? It’s typically defined as the use of matter at dimensions between 0.1 and 100 nanometres. For perspective, a human hair is typically between 80,000 and 100,000 nanometers in thickness. All kitchens have a sink, most of which are fitted with a water filter. This filter removes microbes and compounds that can give water a bad taste. Common filter materials are activated carbon and silver nanoparticles. Activated carbon is a special kind of carbon that’s made to have a very high surface area. This is achieved by milling it down to a very small size. Its high surface area gives more room for unwanted compounds to stick to it, removing them from water. The antimicrobial properties of silver makes it one of the most common nanomaterials today. Silver nanoparticles kill algae and bacteria by releasing silver ions (single silver atoms) that enter into the cell wall of the organisms and become toxic. It is so effective and fashionable that silver nanoparticles are now used to coat cutlery, surfaces, fridges, door handles, pet bowls and almost anywhere else microorganisms are unwanted. Other nanoparticles are used to prepare heat-resistant and self-cleaning surfaces, such as floors and benchtops. By applying a thin coating containing silicon dioxide or titanium dioxide nanoparticles, a surface can become water repelling, which prevents stains (similar to how scotch guard protects fabrics). Nanoparticle films can be so thin that they can’t be seen. The materials also have very poor heat conductivity, which means they are heat resistant. 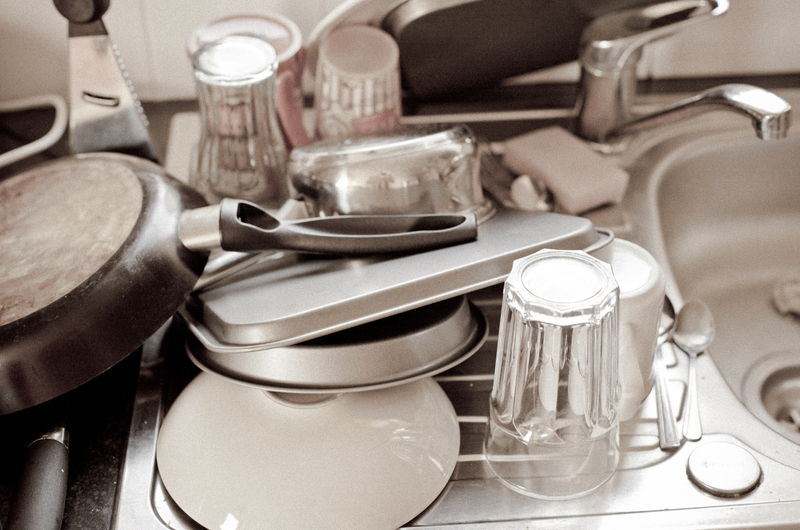 The kitchen sink (or dishwasher) is used for washing dishes with the aid of detergents. Detergents form nanoparticles called micelles. A micelle is formed when detergent molecules self-assemble into a sphere. The centre of this sphere is chemically similar to grease, oils and fats, which are what you want to wash off. The detergent traps oils and fats within the cavity of the sphere to separate them from water and aid dish washing. Your medicine cabinet may include nanotechnology similar to micelles, with many pharmaceuticals using liposomes. A liposome is an extended micelle where there is an extra interior cavity within the sphere. Making liposomes from tailored molecules allows them to carry therapeutics inside; the outside of the nanoparticle can be made to target a specific area of the body. Up to 30% of the weight of laundry powders is made of zeolites. Zeolites are a family of materials made mostly of silicon oxide and aluminium oxide that have specific nanoporous cage-like structures. Similar to how a sponge can absorb water, zeolites can absorb molecules and are used to absorb heavy metals and bad-smelling compounds from the washing mixture. Nanoparticle use in cosmetics is surprisingly common. In some cases, nanoparticles, such as aluminium oxide, are used as a transparent filler material that’s easy to apply as a fine powder. In other cases, nanoparticles play an active role. Fullerenes are carbon arranged into a football shape and are added as “Fullersomes” to some cosmetics to act as antioxidants and free radical inhibitors. Some companies combine gold nanoparticles with silk-like proteins as an anti-ageing/wrinkle mixture. The gold nanoparticles carry the silk-like proteins into cells to restore shape. The bad odour of hiking socks, gym clothes and pillows is caused by bacteria. As mentioned earlier, silver nanoparticles are often added to remove the bacteria and therefore stop the smell. Other products use copper nanoparticles to achieve the same goal. You can purchase linen, towels, clothes, rugs and all manner of material with either silver or copper added. Nanoparticles such as graphene and carbon nanotubes are among the strongest materials known. Currently, they are best used as composite materials to add strength with minimal weight. Both carbon nanotubes and graphene are common additives in sporting equipment such as tennis rackets, golf balls, bicycles, bicycle tyres and golf clubs. Titianium dioxide nanoparticles are often added to paints as UV protection. These nanoparticles absorb UV light before it can degrade the pigments that give paint its colour. They can also add some self-cleaning properties so the paint is water repelling and water droplets quickly run off the surface. Catalytic converters have been used in cars since the 1970s to reduce smog and pollution causing emissions from cars. These converters contain a number of different nanoparticles including platinum, palladium, rhodium and cerium oxide. They cause the degradation of car exhaust into less harmful productions. As you can see, it is likely nanotechnology has already been part of your household for many years.